Abby was a little cat with a huge will to live. She had been in our comfort care program for several years due to severe arthritis of the spine and rib cage. We were able to manage her pain for quite some time, but we could see her body was slowly deteriorating. She rebounded several times, but we knew her time with us was drawing near, and we had to make the difficult decision in her best interest to let her go. Abby had a quiet and controlled personality but could never be underestimated. She asserted herself when it was needed or when the right motivation struck. And that motivation usually came in form of a visiting dog – which is why she was surrendered. Abby arrived after being brought to an out of state Humane Society. One of the vets took her home, but soon realized a jungle cat, no matter how small, was too much to handle. The vet came home to find Abby had her pet dachshund pinned by the throat. Luckily, the vet was able to save the dog, and Abby was sent to our Sanctuary. She continued to be bold through the fence with the staff’s dogs – no matter the size. Her fenced yard kept both her and the visiting dogs safe. Other than that, Abby preferred to nap in the sun in her hammock or tall grass. She would sleep soundly for hours soaking up every ray of sunshine. 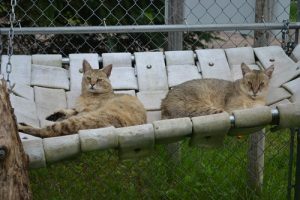 She lived with other cats for many years and could be found sharing a hammock with Kashmir on occasion, but otherwise she was independent. As she aged, and her arthritis progressed, it was time for her to live on her own. She preferred the much slower pace. You helped us build a wonderful new bungalow for her and other solitary cats – each with their own room and access to their very own yard. Even though she was small and aging, she meant just as much to all of us as the young, rowdy big cats. 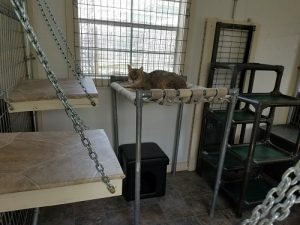 Staff and interns built her multi-layered hammocks and perches for easy climbing. She received her very own firehose hammock – her favorite place to be the last year. And she received one on one attention from her caretakers and neighbor cat Maximillion, the savannah who lived next door. Abby will be missed very much, but we do find peace that we were able to know her and provide individualized care when she needed it most. Abby, you are as big and bold as you want to be now. Please play nice and have fun! We love you and will miss you very much. We received a call from a veterinarian working with a Humane Society. She had taken in Abby, born in 2003, and soon realized Abby was not just a regular cat. 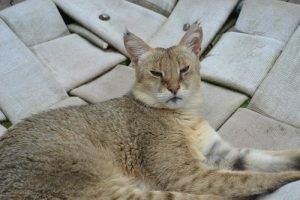 Abby, a jungle cat, had tried to kill a small dog and needed to be placed in a new home. The veterinarian decided Abby needed a special home, where she could live to be wild, as she was intended to be. 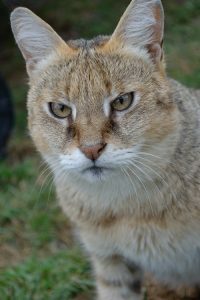 We were happy that we could provide that type of home for her and she came to live at The Wildcat Sanctuary in 2007. Though Abby is a small cat, she is still a wild animal. She loves getting her chicken in the morning and will greet the caretakers with little grumbling noises at the gate. She also likes to lounge on her hammock or perch high in her tree, secretively watching the caretakers. One of her favorite things to play with is a feather toy, but you’d better be quick, because she sure is! Though she’s a small cat, her daily expenses and medical care are just as expensive as many of the other cats we care for.